Free Skype incoming numbers in 36 countries !! In spite of the numerous issues with Skype, Skype continues to dominate the VoIP space. The problem with the closed nature of Skype is that it is extremely difficult or costly to reach Skype contacts from outside Skype. Currently, Skype provides SkypeIN, wherein you can buy a virtual number for yourself and your friends can just dial that number to reach you (on Skype). SkypeIN, however, is expensive – $18 for 3 months of $60 for a full year. Imagine the possibilities. Now you can make free international calls to your friends and family in over 36 countries. More importantly, you do not have to be hooked on to your computer to make Skype calls. Now you can make calls to your Skype contacts on the go. Similarly, your friends and family can call you for free from these 36 countries. 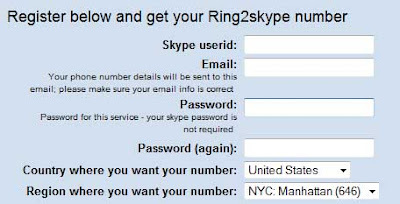 Ring2Skype provides a great method to receive calls on your Skype account for FREE. It is also surprisingly easy to use. All you need to do is register for an account, you only have to enter your Skype id and the region where you want the your number. Currently, you can select regions from NYC, California, Florida, Maine, and New York only. Honestly, this is still a good selection. Once you have completed the registration, you will get a local number for your Skype ID. That’s it!! Just circulate this number to your friends/family and you are ready to receive unlimited free calls on your Skype account.That is not all, you can also use RingSkype to make free calls to your Skype contacts. All you need to do is click the “Add a new number” (look at the above image) and you can enter the details of your friend to get a local number. This is really a great service. I have tested the service and it works flawlessly. There is really no reason for not trying this out. If you are not in one of the 36 countries, chances are Ring2Skype may add your country in the future.